I often look at their little smiling faces, and I wonder how on earth I managed for so many years without them. It's the small moments I try to capture, and burn into my memory. I fear that one day I will sit in a nursing home with nothing but memories, and I want to ensure that I have millions of sunny happy moments in the archives to conjure up at whim. 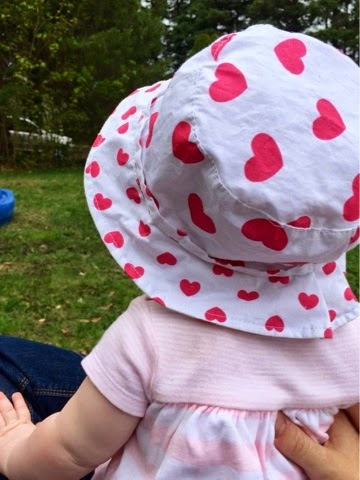 Moments like today when I lay on the couch with my 6 month old daughter, and marvelled at the small chubby arms; the navy romper with white polka dots and a giant daisy; the tiny whisps of red hair sticking up on her head; the smell of baby shampoo on her skin; and her blue blue blue eyes looking into mine. Her smile lights up my heart. Or at bedtime with my son. In the stillness of bedtime, he puts a hand either side of my face imploring me to tell him one more time all of the people in his life who love him. We go through the list, and his smile grows larger with each name. We end on "and who loves you most of all, to the moon and back and more than a million bowls of ice-cream?" "Mama" he whispers in the dark, his smile so enormous that my heart creaks under the weight of it. I kiss his small forehead, and hope that he doesn't notice my eyes are a little wet. Another day gone. Another moment to put away in the memory bank. Another shining bright moment, that I hope I never forget. My children may wonder one day how on earth they will manage without me as they "leave the nest", but I will always know that it's I who will feel the emptiness that time will bring. Being a mother is bittersweet. Enjoy each moment.